For the longest time (and maybe even still do a bit) I associated bravery only with stories of war, speaking in front of massive audiences about theories, and running into the street to save a damsel in distress whose heel got caught in the grate of a drain: the stuff of movies, heroes, and heroines. On one of my last nights back home before this extended trip I sat outside with my mom talking. In the past few years, she has been my number one cheerleader. I’ve had and have incredibly supportive friends, boyfriends, and other family members and I am so mightily grateful for them- but she has stood solid even when others have seriously questioned my actions, lost confidence in me, and during the imperfect times. Before she hopped in her car to head home, she told me how brave I am. I didn’t quite know how to accept that. Most of the time I don’t feel brave, if anything I feel like I’m terrified, always asking silly questions, awkwardly stumbling through the day to day scuffing my knees and twirling my hair, assuming the worst in situations. When I brought this up to her the following day she said those are the exact reasons for why I am brave: despite my worries and shortcomings, I go out and do things anyway. I push to get my perfect ending. For my dreams, whether big or small, to become reality. While I honestly still don’t fully believe her, I remind myself that she believes this about me and that is enough truth for me to continue to keep acting on it. I try not to make decisions based on whether I’ll be in the most comfortable and luxurious situations (although I won’t lie to myself, I adore luxuries), whether I’ll be the smartest or most experienced person in the room, whether I’m going to be embarrassed or have to take a fat bite of humble pie, whether I will experience pain or not- physical or emotional. I want to think I make them based on this screenplay that keeps playing through my head. What makes sense in creating the best life for myself and those around me in the bigger picture? Will this experience grow me or hold me back? Will I gain new perspectives or fall into a rhythm that I’ll won’t want or be able to get out of, even if I don’t feel like I’m fulfilled? Those are the questions I ask as I enter life as an adult, teetering on the precipice of ushering in a whole new chapter of relationships, a family, a home, a career. I see my peers in Phnom Penh, Seattle, New York and everywhere in between being brave every day. Taking risks and leaps of faith that I know for a fact are not the easiest thing to do. Whether they’re choices when it comes to business, family, relationships, and sometimes even all at once- I sit back in awe of them making the conscious decision to make those moves, both figuratively and literally. I have seen so many brilliant people in my short life put their talents, dreams, and thoughts on the back burner simply because it’s uncomplicated and effortless, society expects something different, they’re comfortable in their discomfort, or they’re afraid to venture into something that may not work out. I understand the crippling fear of change or going against the current, maybe even doing a thing slightly differently than originally planned; I don’t make light of that. But I have seen enough of the success stories after taking a step into the unknown to strongly say: GET OUT THERE, WHEREVER THAT MAY BE. 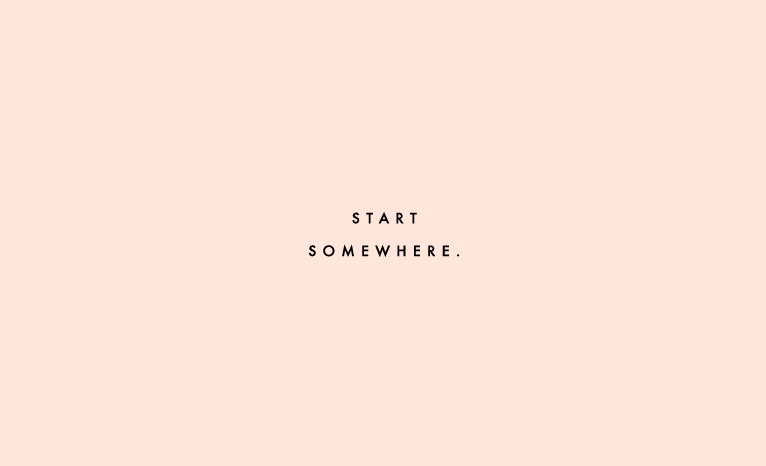 START SOMEWHERE. GO FOR IT. LIVE OUTSIDE THE BOX. MOVE FORWARD. TRY SOMETHING THAT SCARES YOU. STOP THINKING ABOUT HOW YOU MIGHT BE PERCEIVED. FALL, GET UP, FALL AGAIN, THEN GET UP AGAIN. MAKE MISTAKES. LEARN FROM YOUR MISTAKES. I’ve made wrong moves, big ones. Am I sorry that I made them? In short, no. I could look at every business attempt that failed, broken expectations, or person that I was once in love with that didn’t work out and see these moments as time and resources wasted- but if that were my outlook, life would be pretty damn bleak. I’m exactly where I am because of the things that didn’t fall into place. From each thing that doesn’t come together in the way I may have thought it would came a flurry of experiences and people that I may not have gotten to feel. I witness things that I wouldn’t have had the chance to if life had taken the other path where the road forked. I have so much yet to be taught and to learn. I know that with some of the chances I take will be consequences that aren’t pleasant, and may even bite. I will probably turn my back on things that I should go for, either out of fear or ignorance. I am so thankful for the people around me who continue to show me truths, who accept me as I am but push me to grow into the person they know I can be, and showing me what they’re going through, too. That might even be the most difficult thing, letting someone in- and that in itself is an act of bravery. I hope that if you’re reading this you take a moment to think about where you are, what you’re doing, and who you’re with. Where are you being challenged? How are you giving back? What excites you? Are you taking the easy route even though you might want something bigger, potentially better? Question yourself everyday, but remember that you’ve made decisions that are brave. You may be living out courageousness as you read this. It’s worth it to expose yourself to new possibilities. I can’t wait to see where you go. I can’t wait to see what you do. I can’t wait to see your name in lights. All because you started somewhere.